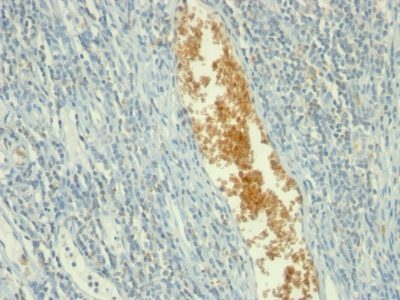 This antibody recognizes a protein of ~90 kDa, which is identified as Adenosine Monophosphate Deaminase, isoform E (AMPD3). 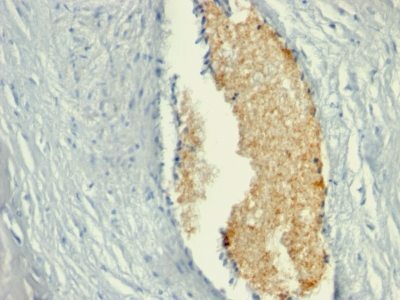 This antibody recognizes a protein of ~90 kDa, which is identified as Adenosine Monophosphate Deaminase, isoform E (AMPD3). It has 767 amino acids and is assigned an EC 3.5.4.6. It is a highly regulated enzyme that catalyzes the hydrolytic deamination of adenosine monophosphate to inosine monophosphate, a branch point in the adenylate catabolic pathway. AMPD3 gene encodes the erythrocyte (E) isoforms, whereas other family members encode isoforms that predominate in muscle (M) and liver (L) cells. This MAb shows reactivity with cells of the erythroid lineage at all stages of maturation in the peripheral blood, bone marrow, and fetal liver. Non-erythroid lineages are negative by flow cytometry. This MAb is useful in the diagnosis of erythroleukemia, identification of bone marrow erythroid precursors, gating erythroid nucleated precursor cells from malignant cells in bone marrow specimens. Catalog number key for antibody number 0901, Anti-Adenosine Monophosphate Deaminase-3 (AMPD3/901) The prefix indicates conjugation, followed by the antibody number and size suffix.